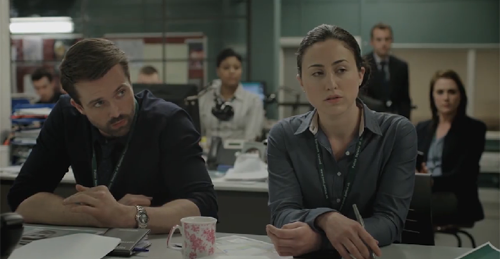 Emmett J. Scanlan in Suspects. This week, finally, Suspects third season started. Also a short season with only four episodes. But in the first, Emmett J. Scanlan starred. I have been waiting! And he was brilliant as usual! But he was really creepy! I never thought Brendan Brady was creepy. Not at all. I always loved Brendan. But this part, the head teacher Rory O'Hanlon, was a real psychopath. Brendan is just a softy-psychopath if you ask me. And a hilarious one. And this shows what a magnificent actor Emmett is, when he is so believable as a creepy head teacher and a sociopathic, self-loathing, homophobic gay man (that character has it all), for instance. Emmett J. Scanlan in The Fall. There's lot's of Emmett right now. We have finally taken up watching the second season of the Fall, and he has an a lot prominent roll in this season. Glen Martin is a quite enjoyable character to watch. And the series is really great! But it is quite weird to see Emmett playing a good guy. The head teacher was creep and sorry Brendan Brady, you were never a good guy, even though I will always love you! Emmett J. Scanlan and Claire Cooper. By the way, more Emmett news for devoted fans: this Christmas Emmett and his girlfriend Claire Cooper (Jacqui McQueen in Hollyoaks) got engaged! He proposed and she said yes. What a joy! Congratulaions to both! I like weddings. I hope that they do to. Two happy birthdays and one congratulation! A new petition to save In the Flesh!